Creatives for Europe, a coalition of organisations, trade unions and representative bodies from the arts and creative industries, launched last week with a panel discussion at the House of Lords. Pippa Koszerek reports. 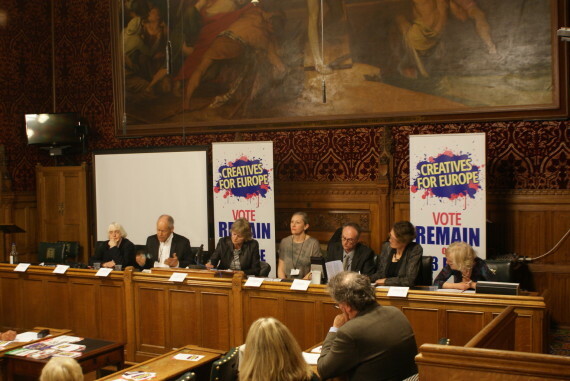 The launch of the Creatives for Europe campaign on Thursday at the House of Lords saw a 16-strong panel make impassioned and evidence-based speeches for why Britain should remain a part of the European Union. Positioning themselves as the most prominent culture campaign for the ‘in’ debate through an affiliation with the European Movement, the presentations were introduced by former MEP and chair of Creatives for Europe, Carole Tongue. Tongue stated how “the European Union is a union of people, of exchange, of cultural diversity and shared heritage. It’s a union of peace ensuring the longest period without armed conflict between member states. We want to highlight the success of the UK cultural industries within the European Union”. The aim of the campaign is to positively shout about the benefits UK culture gains from being part of the European Union and the important role the UK currently plays within Europe. To this end, more statistics were on hand, such as chairman of Creative England John Newbigin’s assertion that the UK cultural industries receive a favourably disproportionate 50% of European Union research and innovation funding because of the strength of the UK’s creative sector, citing the Framework 7 programme for research and technological development as just one example. The economic benefits, however, were not the sole focus of the speeches. Beki Bateson of LIFT festival and Kenneth Olumuyiwa Tharp of The Place described the benefits from intercultural collaboration and the Erasmus exchange programme. Trade unions such as Equity and BECTU described the workers’ rights they had secured through intra-European working. Peace, equality and diversity were also recurring themes, with several speakers projecting a global outlook into this continent-wide debate. Christine Payne, general secretary of Equity, described “the benefits that workers get from combining together in the EU”. She said that, by working on an EU-wide level with an international coalition of trade union and artists’ representative bodies, it was possible to build industrial relationships and establish conditions for workers “in countries where they don’t exist”. BECTU‘s Tony Lennon described how his union had made use of EU channels to fight for better employment rights for cultural workers, taking the then Labour government to the European Court of Justice when they “refused to implement holiday pay for freelancers from day one when the working time directive came into law”. Describing why his trade union are arguing the case to stay in, Lennon explained that, when it comes to culture, the overarching philosophical outlook of the EU benefited the sector. “The special thing is that it’s a place cultural diversity is taken for granted and actually factored into legislation… We’re a small part of the world. We have a multitude of different languages. Different cultural traditions, different forms of expression, they’re all protected by this institution, the EU,” said Lennon. The case for equality and diversity within the EU was made by filmmaker Holly Aylet, founding director of the UK Coalition for Cultural Diversity. She provided a host of examples, from the power that multinationals hold over creative rights on the Internet that can be challenged at EU level, to the EU’s upholding of Unesco’s convention of cultural diversity, which she suggested the UK government had none too willingly signed up to. Beyond talk of the legislative, cooperative and economic benefits, art’s ability to tell stories and convey shared experiences was brought home by writer, Maureen Duffy, who powerfully told of her family home taking a direct hit during the second world war, when she was just six years old. Rescued from beneath the rubble, she learned that a close relative had not survived, after first mistakenly being told that the deceased was her mother. “We invented the EU so we would never again be tearing ourselves and the rest of the world apart again,” she said. Last week also saw the rather more low-key launch of the #Artists4EU campaign at the Queen Charlotte pub in Ramsgate. Instigated by the artist Bob and Roberta Smith, it is essentially a hashtag promoting a ‘Yes’ vote in the EU Referendum.